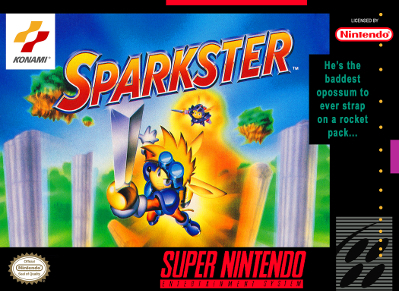 Sparkster for Super Nintendo has you lead Sparkster through nine crazy stages of action-packed platforming fun using a jet pack and his natural affinity for hanging in trees. You've also got a settle to score with Axel Gear, a former colleague of yours who's moved over to the dark side. Along the way, keep your eyes open for power-ups and especially look out for booby traps.